We asked Martin Wilkie from Christchurch for his advise on thrips, he is an expert in all things rhododendron, and Martin has kindly provided us with this fantastic and thorough overview, many thanks Martin. Thrips are tiny dark-coloured insects approximately one millimetre long which live on a variety of plants, including rhododendrons and other evergreen shrubs such as Viburnum davidii in particular. Almost too small to see with the naked eye, they feed on leaves by piercing or scraping the surface of the plant cells and sucking up the contents, leaving a characteristic silvery or bronze appearance and misshapen new foliage. Mites operate in a similar way, but the results are more sandy coloured with black specks, and there is also often a fine webbing left under the leaves. Thrips are flying insects, and can arrive unexpectedly on new plants.They reproduce and spread faster in warmer weather or in a sheltered spot and can build up their numbers very quickly, changing the appearance of a healthy plant in just a few days. They overwinter in the soil or on surfaces like timber fences where there are tiny cracks they can creep into for protection; as a result susceptible plants next to house walls or fences are often the first to show signs of thrip and mite activity early in summer. Rhododendrons are generally healthy plants which are not often affected by thrips. However in hot dry conditions such as a Canterbury summer, thrips will thrive and can establish on rhododendrons which are suffering from heat or water stress. If the soil is dry, the plant should have a good soak but not be overwatered subsequently. Rhododendrons which have indumentum on or under their leaves are less susceptible to thrips. 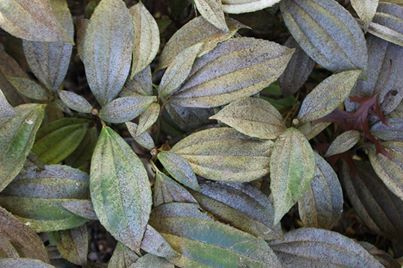 Indumentum is the attractive cream or fawn-coloured 'furry' layer found on rhododendron species such as R. y akushimanum and R. pachysanthum and hybrids or cultivars from these species such as 'Cinnamon Bear', 'Preyii' and 'Walport'. Once silvering or bronzing appears on leaves, unfortunately those leaves cannot recover their green colour but new leaves will develop normally once the thrips are no longer present. The spread of thrips can be slowed or stopped by picking or snipping off the worst-affected leaves if it's a small plant, followed by two or three spray applications in quick succession, about 10 to 14 days apart. Always read the label first, particularly the instructions about dilution rates; and ask the supplier for any advice. Do not spray in hot or windy conditions; spraying in the early morning is often a good technique. Systemic sprays which are absorbed and circulate in the plant's sap for a time are useful (examples are 'Shield', 'Confidor', 'Spectrum'). Sprays which need to contact the insect directly (examples are 'Super Shield'; and pyrethrum-based sprays and Neem Tree Oil) are also effective and include organic options. These contact formulations need to be sprayed up under the leaves and on the branches and trunk down to soil level as well, so as to coat the whole surface of the plant. Make sure to use 'Sprayfix' according to the label, or a teaspoon of dishwashing liquid in 5 litres of the spray mix to get good coverage. Without a mild detergent the spray forms 'beads' on the leaf surface; it needs to spread out with a larger surface area across the leaf surface to be most effective. Oils such as 'Conqueror Oil' are effective, and don't need 'Sprayfix' or detergent to be added; as a contact spray they need to be directed up under the leaves as described. A dilution of 10 ml per litre is the usual recommendation; more oil in the mix can damage foliage, particularly in hot weather. Oil has relatively low toxicity but can mark building surfaces so avoid spraying walls or windows. On larger or older rhododendron plants which have been badly affected by thrips or mites over summer, as a good start it is worth removing as many of the affected leaves as is practical, so that the plant at least looks more presentable. A quick succession of contact sprays to cover all surfaces as described will clean up most of the insects. A light feeding in the autumn (March/April), and watering if needed, will set up the plant for winter. A cleanup spray with oil during winter at 10 ml per litre or as recommended is useful, including the branches, trunk and soil surface where thrips or mites may be overwintering. 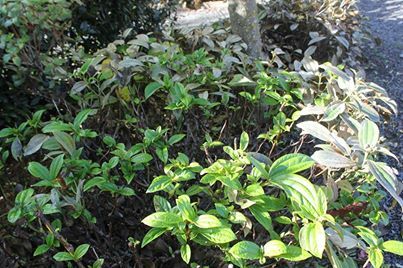 Once the plant has flowered in spring (usually in late September/October/early November), it can be cut back lightly if needed to encourage new growth, fed, and a light mulch of compost applied (no more than 40 mm deep, and not piled against the trunk. Rhododendrons are not big feeders). Most modern rhododendron hybrids and cultivars will come away slowly and cleanly from a light cutback; however some species resent trimming so advice should be sought from a specialist grower or nursery beforehand. A good compromise is to trim back half the branches over the whole plant after flowering, and if re-growth on those branches is vigorous (it may take a month or two to appear), then the following year trim back the rest to a good shape, again after flowering.